1. Do I need to install any software to use this site? No, our site features a built in web Input Method Editor (IME) that lets you type in simplified or chinese characters without having to install any special software. 2. I already have my own Chinese IME (Input Method Editor). Can I use that? Yes, if you want to use your own Chinese IME, then disable the site’s built in web IME on the right sidebar. 3. I’ve never studied any Chinese before. Can I use your site? Absolutely. We assume no knowledge of Chinese and teach you all the basics, along with grammar and sentence patterns to get you going. 4. I’ve already studied Chinese before, but am just getting started with characters. Can I use your site? Yes. Some of the material will still be review, but we’ve designed the lessons so you can quickly scroll past the content you already know. Just make sure you complete all the exercises, so you can track your progress. 5. Do you support simplified characters or traditional characters? We support both forms. Choose your format on the right sidebar, and all the lessons and exercises will be conducted using your chosen format. 6. Which should I learn – simplified characters or traditional characters? If you are planning to do any correspondence with mainland China or Singapore, then go with simplified. If you are planning correspondence with Taiwan or Hong Kong, then choose traditional. If in doubt, then check with native speakers around your area to see which format they use. 7. How do you decide what characters to teach in each lesson? Our site follows the format of HSK, which is the main Chinese Proficiency Test authorized by the Chinese government. Each level on the site corresponds with the matching level in the HSK test. When you complete level 1 of RTC, you will have completed all the words and characters required to do the HSK level 1 test. 8. I noticed that your course doesn’t match the HSK list exactly. Why is that? While we’ve made sure that every character and word from HSK is taught in the RTC course, from time to time we may introduce characters taught from higher levels earlier on, if we feel they are helpful to the learning of related words and phrases. So in each level you are actually learning more than what is required from HSK. 9. How does the Read Type Chinese (RTC) course format differ from Chinese Learn Online (CLO)? - CLO is an audio based course. The lessons are released in audio MP3 format, and there is more of a focus on listening. The lessons can be listened to on the go – while in the car, at the gym or wherever you are. - RTC is designed as an interactive course, with a focus on reading and typing. The student needs to continuously interact with the lessons (by typing out answers) to make progress. 10. I have already completed parts of Chinese Learn Online (CLO). Will RTC be a repeat of what I have already learned? While there are parts of the two courses that do overlap, the character and the word order is slightly different, as RTC follows the HSK character and word list, which CLO does not. Also, since the emphasis on the two courses are different, you will find additional character histories and breakdowns provided in RTC, while CLO provides additional review tools to aid in improving your listening. The two courses complement each other well, so they can be done concurrently or separately. 11. I know most of these characters already. Can I start at a later lesson? Even if you already know all the basic characters, go through all the lessons and exercises from the beginning. Skip through all the explanations and just do the exercises. Each lesson won’t take more than a few minutes. This will make sure there aren’t any characters that you missed. You’ll also get a more accurate count of how many characters you’ve learned in the course. 12. During the lesson, there is a character / word being used that I’ve forgotten. How do I recall it? This is the essence of the course! By reusing characters and words from earlier lessons we are helping you remember them. More common characters are used more frequently making you more likely to remember them in the process. a. Hover your mouse over it to see a popup with its corresponding pinyin. b. Click on it, to see a more detailed explanation on the right sidebar, including which lesson it was first taught in. 13. I’m being asked to reproduce a character / word from before, but I’ve forgotten it, and I don’t remember which lesson it was taught in. Is there any way to proceed? Yes, simply press the Enter button on your keyboard, and you will see a “Hint” shown on the bottom left. Type the character(s) you see shown there. If you still don’t know how to type the characters shown in the Hint, then click on each of the Hint characters you don’t know, separately. 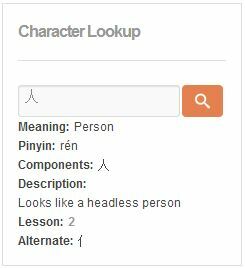 An automatic search will be performed, with the results shown to you in the right sidebar, including what pinyin to use when typing it, and what lesson this character was initially taught in. You may want to review that lesson, if necessary. 14. What is the “Characters Learned” count shown on the right sidebar? When does it get updated? On the right sidebar is a count of all the characters you’ve learned in this course so far. This count is updated when you perform the flashcard test that follows each lesson. 15. I have a question for you, that isn’t answered here. How do I ask it? Click on the “Ask a Question” button that shows on the top of the left sidebar in most pages of this site. A form should appear, that you can fill in and submit. I was really interested in this way of learning. I was wondering if there was a 1 time only charge instead of by monthly subscription after first initial lessons? I would rather do that. Can you also input some of your own vocabulary words or translations from the way we talk everyday? for instance if i copy and paste some of my english text from emails or text messages can this program take those phrases or words and start using a translated version in lessons. That way i can start to type some of my own words in mandarin and feel more comfortable. Good idea. I’ve stopped creating new lessons at the moment, as there hasn’t been enough traction with the current format. I will switch it to a one time payment for now, until I come up with a new format that users prefer.